What is a Lateral Periodontal Abscess? A lateral periodontal abscess is a painful condition in which the soft tissue around a tooth root becomes inflamed and swollen, when a deep periodontal pocket becomes sealed off at the gum line, usually by heavy calculus deposits. Without the ability for drainage to escape the pocket, bacterial infection and fluid from the body’s immune response cause swelling to occur. Within the pocket, acids and enzymes from the infection, and the body’s immune response to it, begin to erode away the tooth’s bony housing. How does the dentist diagnose a Lateral Periodontal Abscess? Presence of a deep periodontal pocket on the tooth, access to which is blocked (generally by heavy calculus deposits). Insertion of a periodontal probe past the blockage may produce profuse bleeding and drainage. An X-ray image (radiograph) of the tooth shows the periodontal pocket—a dark area in the bone adjacent to the root. The tooth may or may not be alive (vital). Combined periodontal / endodontic abscesses do occur. 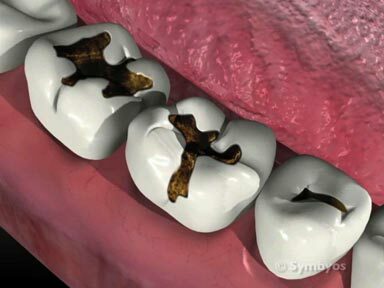 This means the infection may be on the outside of the tooth, inside the tooth, or both. The dentist can use hot, cold and/or mild electrical stimuli to see if the nerves inside the tooth are behaving normally. If so, the abscess probably doesn’t involve the pulp. Sometimes the tooth has a crack, which leads to development of the periodontal pocket. These can be difficult to find, but when present usually make the tooth hurt to bite on. How is a Lateral Periodontal Abscess treated? Scaling and root planing (cleaning calculus from the tooth) and irrigating the pocket with an antibiotic rinse (or placing a time-release local antibiotic) may solve the problem. However, the deep periodontal pocket may require surgical periodontal treatment to prevent reinfection. If the lateral periodontal abscess occurred as a result of a food compaction injury around a poorly contoured restoration (like a filling or crown), the restoration may need to be replaced. Depending on how large a defect exists, it may be possible to regenerate the bone around the tooth. This may require placement of a bone graft. If not, it may be necessary to re-contour the bone to a lower level on the tooth and surgically re-position the gums to eliminate the pocket. Sometimes a combination of tissue regeneration and tissue removal/repositioning is done. If the tooth itself is also infected, root canal treatment of the tooth may be necessary to save it, in addition to the periodontal procedures. In such cases, tooth removal should be considered an option. It is usually a good idea to have teeth that require extraction replaced in order to avoid shifting of the remaining teeth and changes in the bite. Common options for the replacement of teeth include dental implants, fixed bridges and removable dentures.